First cut a 6" x 9 1/2" piece of purple card stock and fold it in half for the base, a 4 1/2" x 5 3/4" piece of black for the middle layer, a 4 1/4" x 5 1/2" piece of patterned paper for the front layer, a 1 3/4" x 3 1/4" piece of black for the image background, a 1 1/2" x 3" piece of white for the image, a 3/4" x 2 1/4" piece of black for the sentiment background, a 1/2" x 2" piece of purple for the sentiment, a 2 3/4" x 4 1/4" piece of black for the strip's background and a 2 1/2" x 4" piece of purple for the strip. 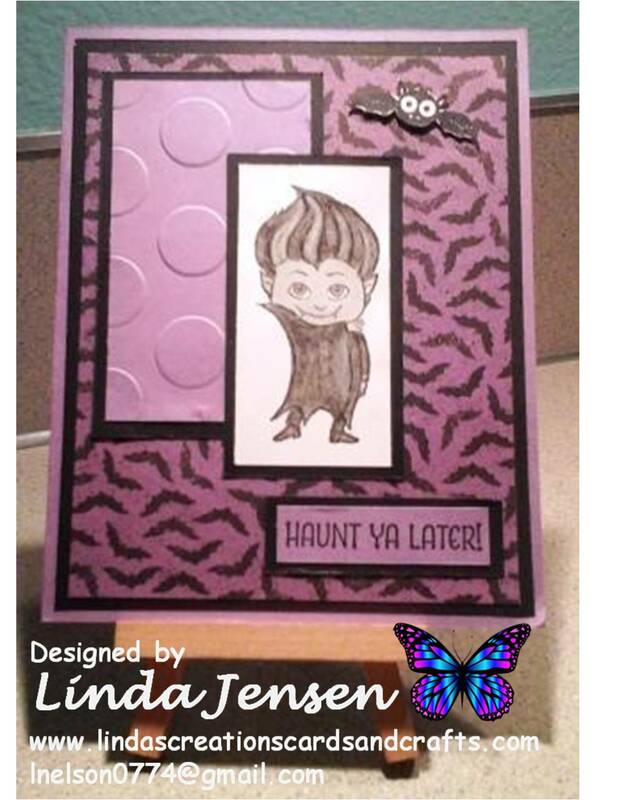 Then dry emboss the 2 1/2" x 4" piece of purple card stock with a Stampin' Up! 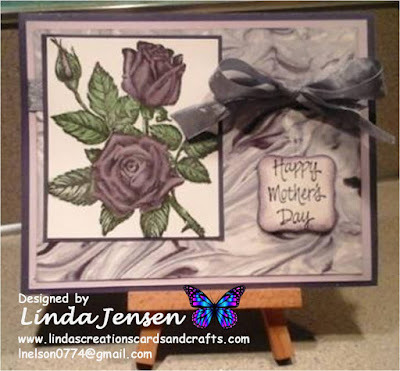 Large Polka Dots embossing folder, attach it to the strip of black card stock then to the front layer. Next stamp the vampire on the white card stock in Stazon Jet Black ink, color it with American Crafts Galaxy black and white markers, then attach it to it's background then to the front layer. Next stamp the sentiment on the purple card stock in Jet Black ink and attach it to the piece of black card stock then to the front layer. Next, stamp the bat in Jet Black ink with a stamp from a Stampin' Up! 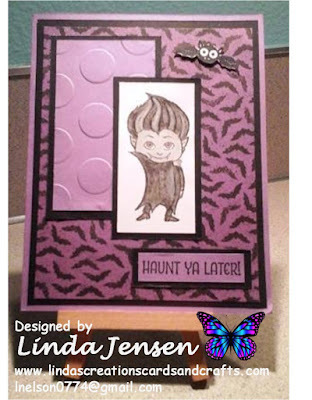 Googly Ghouls set, cut it out and attach it to the front layer with a mini pop dot.Then attach the front layer to the middle layer then to the base and enjoy!